Dombrovsky, a teacher, whose only fault was that during a search they found a suitcase with officer clothes left behind by a family member passing through the town, was tortured in a solitary cell. Dombrovsky confessed of that but the Excommers had a tip that she was hiding gold jewellery received from a relative, some general. That was enough to subject her to torture. Firstly she was raped and abused… Then she was tortured in order to extract information of where she was hiding gold. First, they carved her naked body with knives, then crushed the fingertips with pliers. Suffering and bleeding, the victim pointed at some place in a barn on Medvedev Street where she lived. She was executed at 9 PM and an hour later the Excommers searched that addressed and supposedly found a golden wristband and several rings. An iron glove is used for torture in Kavkazskaya village. It is a massive chunk of steel, worn around the right hand and studded with small nails. Besides pain from the mass of iron, the victim suffers immensely from the shallow wounds left by the nails, that quickly inflame. 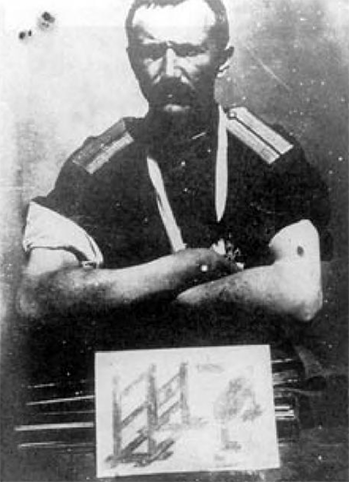 ion Efremovich Lelyavin was subjected to that torture, among others, while the Excommers questioned where he was hiding gold and paper money of the monarchy. A headband is used for torture in Armavir. It is simply a leather strip, connected with a screw and nut. The band is wrapped around the head and the nut is tightened, squeezing the head and causing immense physical pain. To mark its centenary, Alpha History authors live-tweet press reports about the Russian Revolution - as it unfolded 100 years ago.